I read some interesting news in the Telegraph on the search for extraterrestrial life. Prof John Parnell, 55, has co-written a theory with Dr Joseph Michalski, a planetary geologist at the Natural History Museum, that suggests they have discovered the best signs of life in the huge McLaughlin Crater on the surface of Mars. The document, published today in Nature Geoscience journal, describes how they assessed the crater, created by a meteorite which smashed into the surface of Mars, flinging up rocks from miles below. The rocks appear to be made up of clays and minerals which have been altered by water – the essential element to support life. Speaking from his laboratory at the University of Aberdeen, geochemist Prof Parnell said: “We could be so close to discovering if there is, or was, life on Mars. “We know from studies that a substantial proportion of all life on Earth is also in the subsurface and by studying the McLaughlin Crater we can see similar conditions beneath the surface of Mars thanks to observations on the rocks brought up by the meteorite strike. “There can be no life on the surface of Mars because it is bathed in radiation and it’s completely frozen. However, life in the sub surface would be protected from that. “And there is no reason why there isn’t bacteria or other microbes that were or still are living in the small cracks well below the surface of Mars. “One of the other things we have discussed in our paper is that this bacteria could be living off hydrogen, which is exactly the same as what microbes beneath the surface of the Earth are doing too. “Unfortunately, we won’t find any evidence of animals as the most complex life you might get in the sub surface would be fungi. I think that any life on,or in, Mars is likely to be very simple, perhaps similar to bacteria, assuming that there is any at all. We are going to actually go there and look specifically for life. Fortunately, that may be the next step. Prof Parnell reckons that although the next mission to Mars will have a drill to examine possibilities of life beneath the surface of Mars, he says his new study suggests looking around the edges of craters would be easier and more beneficial. He said: “What we’re really doing is emphasising that if we are going to explore for life on Mars, we need to go beneath the surface. So we need to find an approach beneath the surface. “One approach to do that might be to drill and indeed the next European mission to Mars will have a drill on it, but that will only go down about two metres. “And although drilling two metres on Earth would be a fantastic technological achievement, it’s only really scratching the surface. I think they meant to write Mars instead of Earth. “So the alternative is to use what nature has done for us and that’s why we are are particularly interested in the McLaughlin Crater that we have investigated in our paper. And while the craters on Mars may uncover secrets about the planet’s possibility of supporting life, Prof Parnell also revealed the results could show us how life on Earth began. He said: “It’s very easy to draw parallels between what Mars looks like and what the early Earth might have looked like, because the rocks on Earth that we see now have been recycled a lot in ways that they have not been recycled on Mars. “Mars has not had things like erosion and shifting of mountain ranges to destroy vital evidence from the past. “So studying meteorite craters of Mars may well actually give us an indication to how life on Earth began. “Although we all live on the surface of Earth, life did not originate here, but actually in the sub surface. 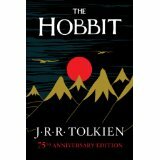 “It was only when life had taken hold below the surface that it gradually expanded and came up to the surface. This sounds a lot like The Deep Hot Biosphere. The lyrics to the song don’t seem to make a lot of sense. Why would Yankee Doodle stick a feather in his cap and call it macaroni? A hat with a feather stuck in it hardly resembles a plate of pasta. 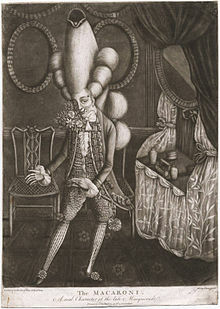 Actually the word macaroni in the song is eighteenth century slang meaning the sort of man who spent a more time worrying about clothes and fashion than about more manly pursuits, in other words, the sort of man who would later be called a fop or dandy, or in the twenty-first century, a metrosexual. It was the custom of the eighteenth century for young British men of wealth or the nobility to go on a grand tour after finishing their formal education. They would travel around Europe visiting France, Austria, Italy, etc. The idea was to give these future leaders of Britain a bit of polish and culture, to acquaint them with other countries, to view great works of art, and so on. Since these were young noblemen, it is likely that they spent more time in taverns and brothels than in museums, but it was still a nice idea. In their travels the young men would pick up the latest styles and fashions from France or Italy and bring them home. To those Englishmen who had to stay at home and to the exasperated fathers of the stylish young men who paid for the trip, these fashions seemed outlandish and even a little bit effeminate. Since they also brought the exotic Italian dish known a macaroni back with them, they were derisively called macaronis. Would you want your son to come back looking like that? Before the French and Indian War, the English had largely neglected their colonies in North America. 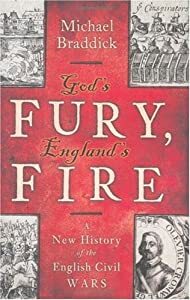 Previous wars between the English and French had largely been fought with colonial militias and the Indian allies of the two kingdoms. The French and Indian War, or the Seven Years’ War developed into a worldwide conflict, in many ways it was the first real world war. For the first time, Great Britain deployed large numbers of British regular soldiers, or redcoats to fight in North America. These regular soldiers from the mother country tended to despise the colonists, or Yankees, as unsophisticated yokels. 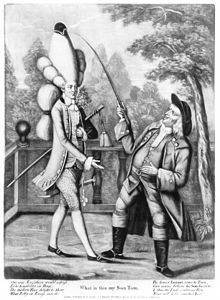 As far as they were concerned, one of these rubes might well think having a feather in his cap was the height of fashion, making him a macaroni. The British regulars also felt contempt towards the colonial militias thinking them, with some justice, as untrained, undisciplined braggarts likely to run away at the first exchange of gun fire. To mock the pretensions of the militiamen, the redcoats sang Yankee Doodle,a song attributed to a British army surgeon named Doctor Richard Shuckburgh. Here are the complete lyrics. During the Revolutionary War, the Americans in the Continental Army had adopted Yankee Doodle as their own anthem and by the time they played it at the British surrender at Yorktown, the song had become detestable in the ears of the Redcoats. I wonder, though whether the condescension shown by the British soldiers towards the colonial militia wasn’t one of the ultimate causes of the War of Independence. The French and Indian War must have been the first time many of the colonists had been exposed to the sort of disdain that many on the mother country felt for the colonials and I am sure they didn’t like it. This was certainly the case with George Washington. He had commanded a regiment from Virginia during the war. He felt a certain pride in the men he had led and trained and he resented the way in which the British officers dismissed them. During the war, Washington had applied for a commission in the regular army. Although he was uneducated and lacked connections he felt that his experience in combat proved his worth. The British commanders rejected his application in particularly humiliating terms, making it obvious than no mere colonial could get a commission. Maybe the humiliation still stung when Washington accepted the job of Commander in Chief of the Continental Army. I have been invited to participate in a grassroots organization to help President Obama get his agenda passed. I feel so privileged. I’m Jon Carson, the new executive director of Organizing for Action. I hope you’re as excited as I am for this new organization, and for what our grassroots movement can accomplish in the next four years. If you haven’t already, you should check out this short video First Lady Michelle Obama recorded about our organization, and then say you’re on board. Just a little bit about me. I’m a Wisconsin guy, and I grew up on a farm in the western part of the state. In 2007, I joined Barack Obama’s campaign and served as the national field director. After the election, I went to work for the President in the White House, most recently in the Office of Public Engagement. That brings me to now, when very soon, my family and I will be moving back to Chicago as I start this new role with all of you. I first joined the President’s campaign because I was inspired by his belief that ordinary people have the power to change our country if we work together to get it done — and that belief will be at the core of this new organization as it unfolds. And the way we’ll get it done can be summed up in one word: local. That means each city or region will have its own OFA chapter, and you’ll decide the issues your community cares about most, the work you want to do to make progress on them, and the kind of support you’ll need to get it done. At a neighborhood and regional level, OFA members will grow their local chapters, bringing in new leaders and helping train a new generation of volunteers and organizers to help fight for the issues at stake. There’ll be times when we pull together at the national level to get President Obama’s back on passing major legislation, like reducing gun violence or immigration reform. And we’ll all work to help transform Washington from the outside while strengthening our economy and creating jobs. But for the most part, the direction our work takes will be completely in your hands — with the support of this organization behind you every step of the way. In the next few weeks and months, I’ll be asking for your input on putting together an OFA plan for 2013, we’ll be holding online briefings about the issues we want to tackle, and we’ll start organizing on those issues as they’re debated in D.C. But for right now, I just want to say thanks and welcome. There’s a lot to be done, without a doubt — and I couldn’t be more thrilled to be part of OFA with you. If you thought the campaign was over last November, than you are about to be seriously disappointed. The campaign never ends nowadays, and I guess we never get a break from politics anymore. I wonder though, what kind of grassroots organization is run out of the White House? Isn’t this better described as astroturfing? When some future incarnation of Edward Gibbon writes the definitive account of the decline and fall of Western Civilization, I am sure that Jerry Springer will play a prominent role in his narrative. 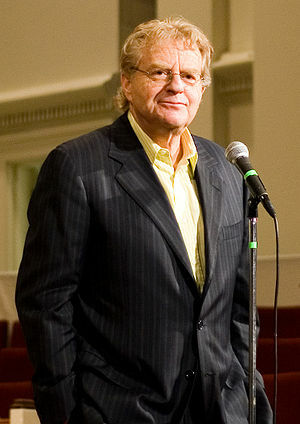 Jerry Springer himself has admitted as much in this story in medialite.com. I wouldn’t dream of arguing with him about it. I didn’t actually know his show was still on. I haven’t watched it for years. Somehow I don’t think I am the worse for it. I had thought that my friends in the Democratic Party had forgotten all about me since I have hardly gotten an email from them since the election. I am happy to say that this is not this case. They need me to stand with Barack Obama in his fight against the nefarious NRA. friend — Today, we have the momentum to take monumental steps toward reducing gun violence. But the NRA and their army of lobbyists are working to tear any proposal to shreds. If we don’t stand up to the NRA immediately, they will destroy our chance to stop gun brutality. But the window of opportunity is so small that I need you to act right now so it doesn’t slip away. Sign the petition and denounce the NRA immediately. Stand with Democrats who want to reduce gun violence. Let’s get 100,000 signatures by midnight tonight! The NRA will do anything to demolish common-sense gun laws. They even released a repulsive ad that calls President Obama an “elitist hypocrite,” and uses his children as political pawns. If we want to reduce gun violence, we must stand united against the NRA. Add your name right away so we can reach 100,000 grassroots supporters by midnight tonight. I can think of many other groups that have armies of lobbyists and at least the NRA doesn’t pay for their political action by taking money from people who are compelled to be members as the labor unions do. In any case the reason the NRA is so politically powerful is not so much because they hire so many lobbyists but because so many Americans happen to agree with their position on the second amendment. I have not seen the NRA ad, so I do not know if it is repulsive or not. President Obama is using other people’s children as political pawns so he is hardly in a position to complain. He does indeed come across as a elitist hypocrite by denying parents the same right to protect their children as he enjoys. The president’s children are in more danger than others of having some harm come to them because of who their father is and I am sure that no one begrudges them their protective detail from the Secret Service. 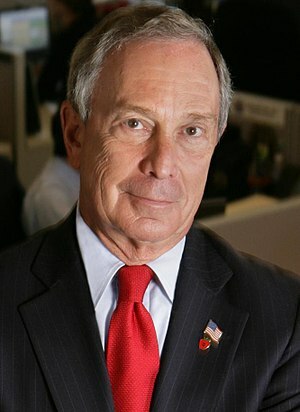 However, other people’s children are in danger and if parents feel that their children would be safer with armed guards in their schools, the same privilege that all the students at Sidwell Friends School and other elite private schools enjoy, why shouldn’t they be permitted to have armed guards? I also got a message from Jim Messina. Yesterday, President Obama announced his plan to protect our children and our communities by helping reduce gun violence. We won’t stop every violent act like the one in Newtown, Connecticut. But if we can save the life of even one child, the President believes each of us has a responsibility to take action. People like you spoke out and demanded action. Your input, along with ideas from leaders and policymakers across the political spectrum, went into the President’s plan. Learn more about the plan, and say you stand with President Obama in tackling this critical issue. Most gun owners use their guns safely and responsibly, and the President believes firmly in protecting our Second Amendment rights. But common-sense changes can go a long way in keeping our streets and our schools safer — and there’s too much at stake to stand by and wait for action. The President will not wait. Yesterday, he signed 23 executive actions to start moving our country in the right direction. And he’s calling on Congress to act on four legislative measures — closing background check loopholes, banning military-style assault weapons, making our schools safer, and increasing access to mental health services — right away. I thought the campaign was over. This idea that if we can just can just save one life we should do it is truly dumb. There is no consideration here of any sort of cost/benefit analysis. The question to ask is what benefits we gain from an action at what cost and if the benefits are worth the cost. There are a great many things we could do that would save lives. We could pass a national speed limit of 20 miles per hour. We could outlaw, not only all guns, but knives, clubs, and every sharp object. Setting up a North Korean style police state could save many lives. None of these measures would be worth the cost in freedom and difficulty of enforcing them. This may seem like a cold, hard hearted way of looking at things, but each individual human life is not of infinite value. Anyone who has been responsible for creating safety measures knows that you have to balance the number of lives potentially saved against the increased costs that such measures will produce. Environmental regulations cannot be designed to remove all traces of pollutions but can only reduce the amount of pollution in the environment to acceptable levels. A policy that saves only one life is probably not the most effective policy. Now, of course, to every parent, their children are of infinite value. That is understandable. Policies, however, ought not to made by emotional appeals and quick action but by carefully considering what works best with the most acceptable costs, in other words, the exact opposite of what President Obama and his supporters are doing. WSJ/NBC Poll Shows Continuing Support for NRA (blogs.wsj.com) Who is denying reality? White House calls NRA video repugnant, cowardly (newsobserver.com) Well, I find a lot of what the white house does is repugnant and cowardly.